Site was Last modified: January 31 2019. 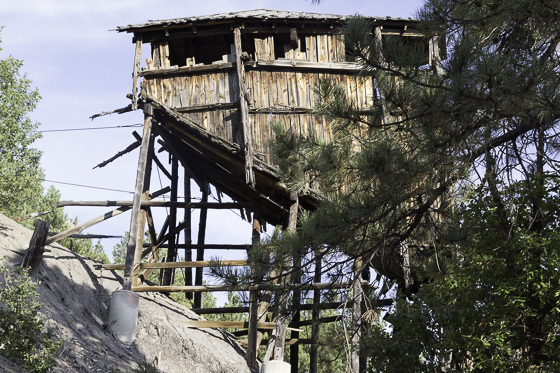 As we were leaving the Devil's Tower National Monument, we noticed a sign to the Aladdin Tipple. We had plenty of time, so we stopped to see what the Aladdin Tipple was. 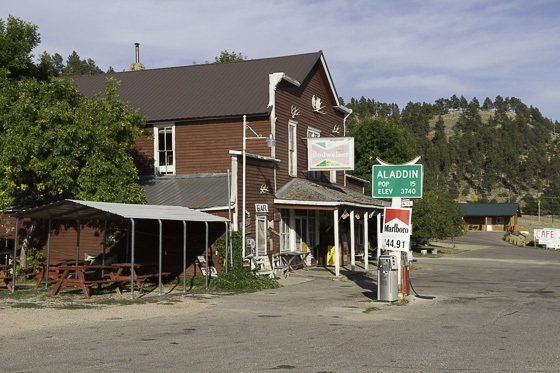 The Aladdin Tipple is in the town of Aladdin, Wyoming population 15 according to the sign. 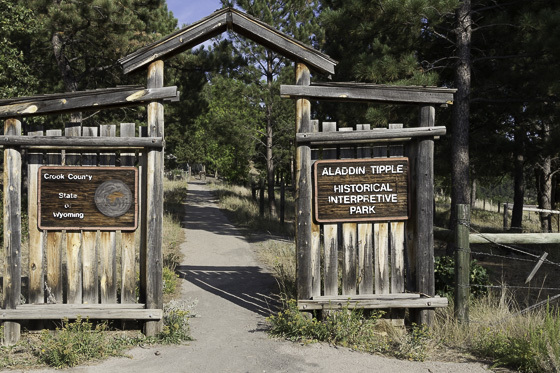 The tipple is located in a historical interpretive park. There is an easy path to the top of tipple. There are several signs explaining the history of the coal mine and explaining the tipple. A Tipple is used to transfer coal from the mine for transport usually by railroad. The Aladdin Tipple is one of the last wooden tipples in the US. The tipple as two main part, the coal bin on the uphill side, and the chutes on the downhill side. The coal is loaded from the mine to the bin. When a rail car is ready to be loaded, the bin is open and coal moves down the chute by gravity. The tipple at Aladdin was designed to sort the coal into nut, egg, and lumped size pieces. 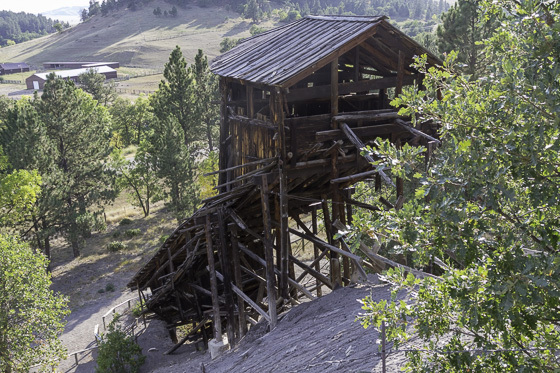 Tipple are no longer used in the US coal mining industry. 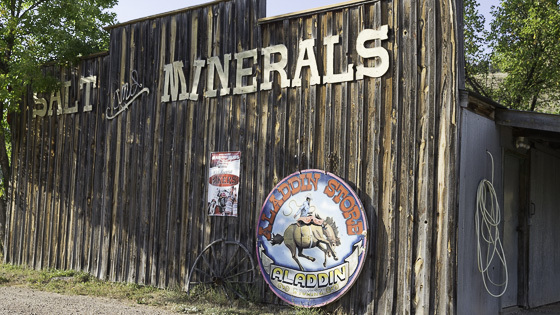 The history of the Aladdin Tipple from the Wyoming Historical Marker. 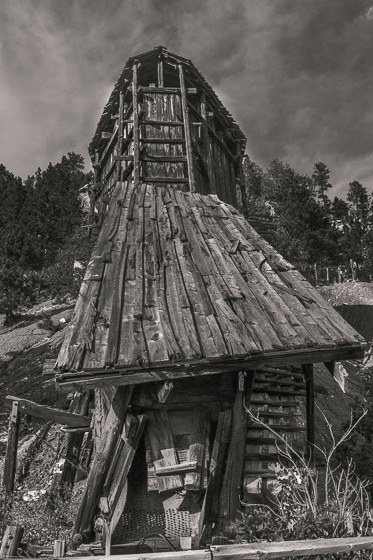 The Aladdin Tipple in Crook County, Wyoming, was constructed as part of the Aladdin coal mining operations. In 1898, an 18-mile-long short line known as the Wyoming and Missouri River Railroad was built to connect coal mines near Aladdin with the Chicago and Northwestern Railroad main line at Belle Fourche, South Dakota. 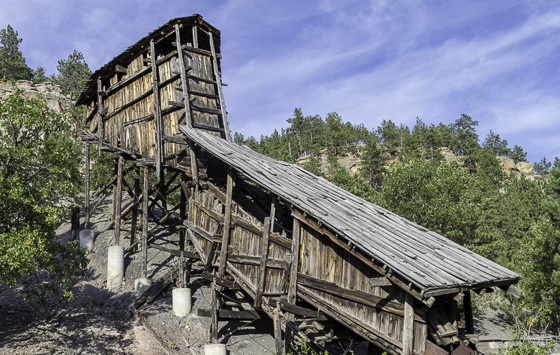 The railroad linked the coal mines at Aladdin with the gold smelters at Lead and Deadwood. The Black Hills Coal Company, which built both the mine and the Wyoming and Missouri River Railroad, was founded in 1895. The Chicago and Northwestern Railroad surveyed the route and assisted in developing the short line to Aladdin by supplying rolling stock and construction supplies. In 1899, M.S. Kemmerer, who was at the time developing the Kemmerer coalfields, bought the controlling interest in Aladdin mines and the Wyoming and Missouri River Railroad. Kemmerer's purchase of the mines and railroad ensured the venture would have sound financial backing. However, like many short lines in the region, the Wyoming and Missouri River Railroad had a history which was more colorful than profitable, and when coal supply dwindled, the railroad was eventually abandoned. Travels with Nessie Home :: Site Map:: Contact webmaster@ncsparks.com-email us:: Copyright Leslie Sparks 2006, 2007, 2008, 2009, 2010, 2011, 2012,2013,2019:: Last modified: January 31 2019.